Ok, I’ve been on temple overload this month and it seems you’re on the receiving end too. Between Sri Lanka and Malaysia, I have seen enough statues of Buddha to last me for a while, and taken enough photos too that while sorting through them, I’m getting confused of which is which! Additionally, in Sri Lanka, a shrine can be found easily even along any main road that one takes, so I couldn’t even tell you where I have seen which. Ooops. This will be the last among the temple-related photos for now though. I’m heading back to Paris tomorrow, but before that, a visit to our local temple is a must, for a prayer of safe journey for myself and good health for my family. 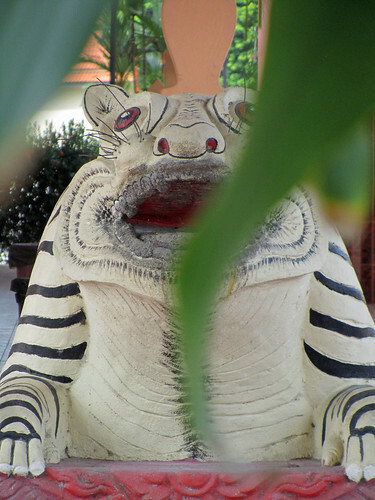 The tiger god is a guardian spirit of the temple and from where I stand, it looks calm yet alert and stern, ready to confer its protection. I feel strangely serene here.